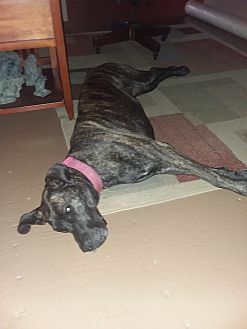 Lena is a 2 year old, 114 pound Great Dane mix. She would do best in a quiet home with no children where she is the only pet. Because of her strong prey drive, she would not do well with cats. 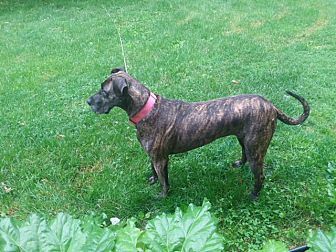 She is very strong, so needs a family who can handle this. Another thing is that she will not do stairs. She is house and crate trained. She is a very sweet and loving dog. 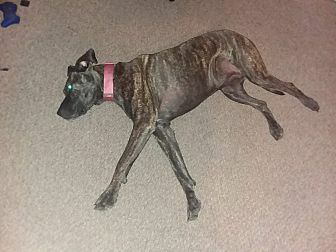 She is a leaner like most Great Danes. She is most happy to nap the day away by your side or somewhere nearby. She is more of a shy dog, but does well with small groups. She has been working on her commands and manners. She knows how to sit and stay, but is also easily distracted. Lena does not destroy her belongings or that of her family outside of anything made of foam (Nerf darts, balls, etc). She still has every toy we have given her. She absolutely loves blankets and will even try to steal the couch cover we have since it's just a giant blanket in her eyes. She has random short bursts of energy before she tires herself out to take another nap. She also loves being outside and car rides. She came to us a little over a year ago from a shelter and we have enjoyed her company while we watched her adjust to a real home. We could tell right away that she had been abused, but have seen a lot of improvement in the past year. With love and patience she will continue to improve. This dog is altered and up to date on shots. 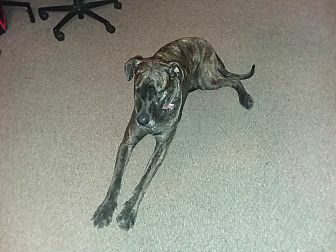 If you would like to meet this dog please call Teri at 630-897-7454. The adoption fee is $200.